It’s hard to beat this premise: A pirate captain kidnaps a renowned chef and tells him that his life hangs on whether he can produce a private dinner every Sunday worthy of his talents. Throw in that the pirate is a woman who earns her sailors’ adoration by her fairness, strategic gifts, and success at pillage, and you’ve got a delicious literary confection in the making. 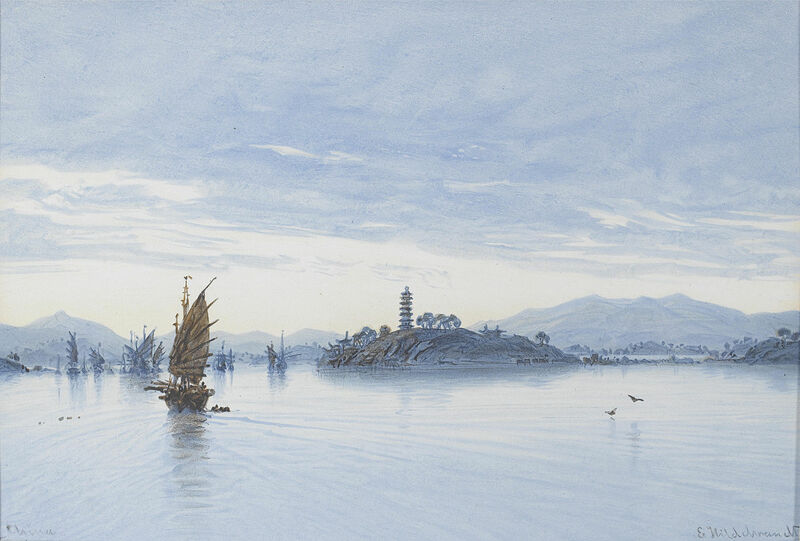 View on the Pearl River, Macao, by Eduard Hildebrandt, 1850 (Courtesy Wikimedia Commons). The year is 1819, and Owen Wedgwood serves Lord Ramsey, director of the Pendleton Trading Company, as personal chef. His lordship has brought Wedgwood to cater a weekend party of company officials at the seaside town of Eastbourne. But Mad Hannah Mabbot crashes the dinner, kills Ramsey and others, and brings the cook back to her ship, Flying Rose. Shocked by the wanton bloodshed and outraged at having to feed a murdering villain to save his life, Wedgwood plots his escape, even as he bends his skills to play culinary Scheherazade. Of course, she was a tyrant and a criminal, but when she ate, I saw in her a radiant life, a deep hunger, and an almost pious reflection on each moment. When she swallowed, her nostrils flared like those of a running horse, yet her hunger was sophisticated. The ladies I had served in the past knew how to hold salad forks and discuss the latest fashions, yet their palates were blind. Mabbot claimed each dish as Moses’s men claimed the land of milk and honey. This dynamic, which Brown handles deftly (down to the biblical allusion), makes perfect sense. But otherwise, I think the narrative gets away from him. Rather than unfurl all his canvas and run before the wind, pushing the improbable and eccentric to the limit (as with, say, George McDonald Fraser’s Flashman series), Brown has unfortunately trimmed his sails. It’s as if he decided that his novel must be About Something. Consequently, Wedgwood has to learn, gradually but surely, that Hannah Mabbot defies the moral certainties he’s held throughout his life, and that there’s more to her murderous escapades than meets the eye. He discovers that the Pendleton Trading Company (read: The East India Company) has beggared entire populations through the production and sale of opium, forced labor, and violent suppression of protest or competition. No argument, there, and hardly a surprise, but this theme belongs more to a serious novel like M. J. Carter’s Strangler Vine (reviewed December 14). Here, it requires a bulky backstory, as does why Mabbot hates opium trading–and the more I read, the less I believe it. Even more convoluted, Brown introduces a French antagonist to Mabbot named Laroche, whose futuristic ships seem like something out of Jules Verne. If Cinnamon and Gunpowder’s a hodgepodge, its redeeming, dead-center feature is the food. Chef Wedgwood’s recipes are absolutely inspired, as are his adaptations to working in an ill-equipped, understocked pirate galley, not least of which is how he crushes nuts and spices with a cannonball. To me, a passionate cook, those parts of the novel are the most memorable, and it’s no wonder that Hannah Mabbot enjoys what her captive dishes out.